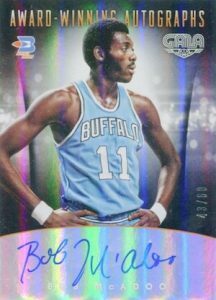 Picking up from the 2014-15 debut, 2015-16 Panini Gala Basketball again incorporates a star-studded theme and very low print runs. Hobby boxes feature a combination of autographs and relics that total to four hits. 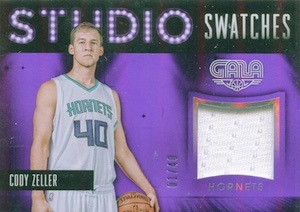 Certainly not a set collector's dream, base cards drop one per box. 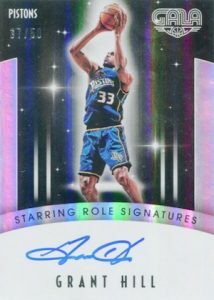 However, the limited base rookies cover 25 players and are numbered to only eight copies. This makes them the toughest to track down of any set and a very rare RC collectible. Continuing the theme of a Hollywood premiere, autographs take several forms with all inserts numbered to no greater than 60 copies. Among the signed sets, Cinematic Signatures is numbered to 60 or less and uses wide-angle photography. Headliners features ten of the very elite of the NBA with a print run of just eight. Offering sub-themes like Comedy, Drama, and Thrill, Genregraphs (#/25) showcases various on-court emotions from top stars. 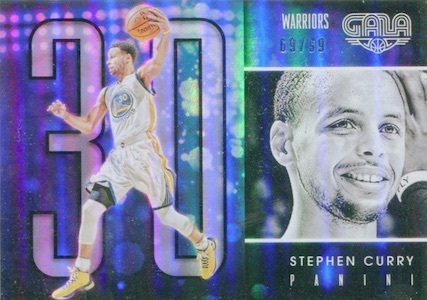 Likewise, 2015-16 Panini Gala Basketball relics are also serial numbered to 60 or less. With a grand total of five memorabilia inserts, options include Coming Attractions and Primetime Memorabilia. 2015-16 Panini Gala Trey Lyles ROOKIE RC 7 8 Denver Nuggets RAREST ROOKIE CARD! 2015-16 Panini Gala Chris Paul Red Carpet Auto 30! 2015-16 Panini Gala Chris Paul Jade Auto 25! 2015-16 Panini Gala Kelly Oubre Jr Rookie Jersey Patch LOGOMAN 1 1 RC 1 of 1! 150 cards. Veterans/Legends serial numbered #/99, Rookies serial numbered #/8. 39 cards. Serial Numbered #/40. 99 cards. Serial Numbered #/60. 33 cards. Serial numbered #/60 or as noted below. PARALLEL CARDS: Purple #/40, Jade #/25 or less, Crimson #/10 or less, Midnight 1/1. 10 cards. Serial Numbered #/8. 65 cards. Serial Numbered #/60. 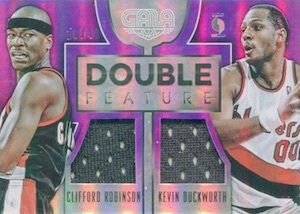 PARALLEL CARDS: Purple #/40, Crimson #/10 or less, Prime #/10 or less, Midnight 1/1. PARALLEL CARDS: Director's Cut #/10. 59 cards. Serial Numbered #/40. PARALLEL CARDS: Red Ink #/10. *Rookie #8 not found in parallel. 29 cards. Serial Numbered #/60. 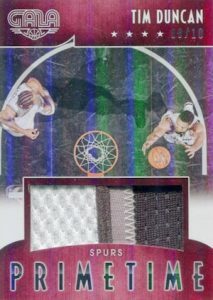 PARALLEL CARDS: Purple #/40, Prime #/25 or less, Crimson #/10, Midnight 1/1. rookies were hard to come by. I think gala is a little overpriced based upon the two years I have broken wax. opened 4 boxes. got porzingis green cinematic and blake griffin auto to 10. 2015-16 Panini Gala Basketball Sealed Hobby Box - Towns Booker Jokic Porzingis ?